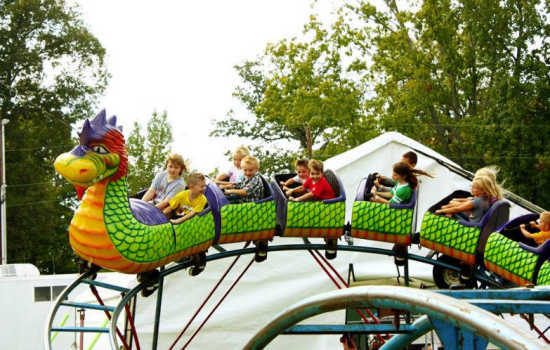 Past: East Perry Community Fair "The Best Little Fair in the Land"
The "Best Little Fair in the Land" will open with a parade on Friday, September 21 at 1:30 p.m. followed by opening ceremonies and continue through that evening and the entire day on Saturday, September 22. The fair, which is held in Altenburg, continues to promote itself as a traditional agricultural fair that, in contrast to other high priced presentations, still has free parking, free admission, and a variety of free entertainment and spectator events. The popular 4X4 Truck Pull returns on Friday evening at 7 p.m. as does the fair’s largest spectator draw, the “World Championship” Mule Jumping Competition at 4:30 p.m. on Saturday. Returning for the third year is a Lawn and Garden Tractor Pull at 7 p.m. on Saturday. The pull is being put on by Wilhite Pullers of Patterson, Missouri. Two of the largest competitions on Saturday will be one of the ten largest beef cattle shows in Missouri in the show barn at 9 a.m. and the draft horse and mule show including several hitch classes in the arena beginning at 10 a.m. The annual 4-H and FFA Youth Steer Sale will be held at 5 p.m. on Saturday. For additional information visit the fair’s new website www.eastperryfair.com or its Facebook page. If you have questions prior to or during the fair, please call 573-824-5322.